During a meeting of Chatelaines, the subject of live action role playing games (LARP) and SCA recruitment came up for discussion. The term live action role playing games is often met with mixed reactions in groups like the Society of Creative Anachronism, but what really defines a LARP, how close is LARP to the SCA, and what are the prospects for recruiting new members from LARP groups? Prior to joining the SCA I spent 16 years running and playing in various live action role playing games. I don’t consider myself an expert in either activity, but I believe my experience gives me an interesting perspective on how the SCA and LARP can mutually benefit from associating with each other. In the broadest sense of the term a LARP is defined as any activity where participants assume the roles of fictional characters (fictional in the sense that they are not playing themselves) and act out the lives of these characters in a real world setting. The “game” aspect of the LARP typically comes in the form of an objective of the game (completing quests, gathering treasurer, defeating enemies, etc.). How the players achieve this objective is determined by a mutually agreed upon set of rules. Many of the original LARP games involved fantasy settings, but over the years have grown to include a wide range of genre including horror, mystery, science fiction, and modern military simulations. Some LARP games involve a high level of physical activity including simulated combat (not unlike the SCA) with padded weapons. Many games use fictional skills and abilities to compensate for talents or abilities not possessed by the actual players (such as casting magic spells, playing fantastic races like Elves, etc.). Some LARP games require little physical activity and discourage direct physical contact between players. Games like this are typically meant for venues where things like mock combat are not permitted; schools and colleges for example. Live action role playing games are not a new concept and many of the original live action games started as early as the late seventies before spreading into international interest in the early eighties. Today LARP games of all sorts are played all over the world by millions of players. Why does the term “LARP” make certain people cringe? The term LARP is often met with disfavor in groups like the SCA and many people become upset when they hear the SCA described as a LARP. A large part of the issue comes from the public’s perception of LARP and the people who play LARP games. LARP has held a stigma in society since the eighties when movies such as “Mazes and Monsters” and books like “The Game Master” gave many people the perception that LARP was a secretive game played by people on the fringes of society. At the time most people had limited access to information about LARP games and as a result the media found it easy to paint LARP as the “boogeyman” out to corrupt the minds of its players. Many years have passed, but this stigma still exists. Where the media once used LARP games as precautionary tales, modern media paints LARP in an almost humorous or childish light with movies such as “Role Models”. It is reasonable to assume the average modern SCA member is informed enough to grin at such public perceptions, but this negative stereotype can still hurt recruitment with the general public who are not as use to the concept. Further complicating the issue is the fact that many LARP games involve a higher level of fantasy elements (monsters, magic, etc.) not common to more low fantasy/historical based groups like the SCA. While the SCA is not purely historically correct, many SCA members do not want to be associated with dragons, wizards, and elves. LARP games also allow players to replace real world ability with fictional skills. Instead of spending hours at practice learning to fight or perfect a craft, a LARP player can simply buy a fictional ability giving them similar advantage in the “game”. 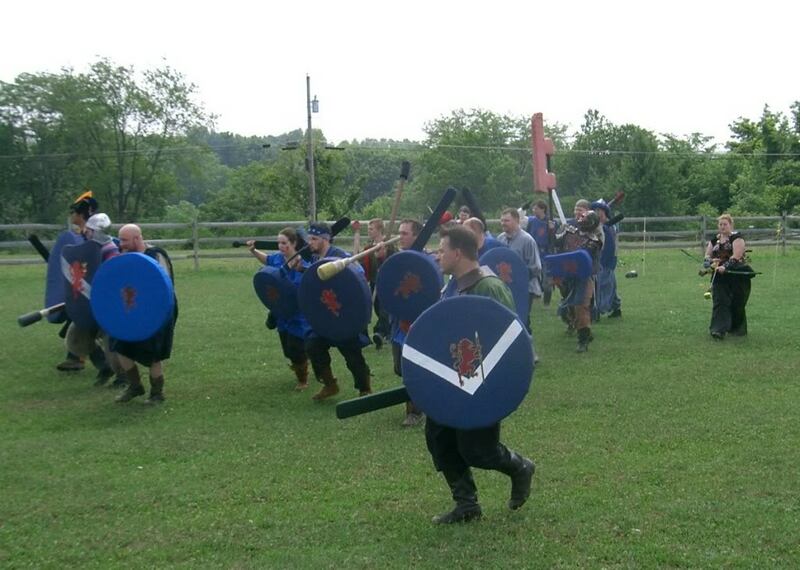 Often people feel calling the SCA a LARP lessens the dedication and time invested in SCA activities. The level of differences between a given LARP and the SCA will differ from LARP group to LARP group, but the perception is still there. Combine all these elements and it is easy to understand why the average SCA group will shy away from association with LARP. While increased public exposure to LARP has lessened this stigma over time, people are still gun shy about associated group like the SCA with LARP games. In turn many in the SCA seek to separate the SCA from LARP as much as possible to prevent any connection with the negative stereotypes of LARP. Sadly this can also result in alienation of LARP players and in turn rob the SCA of possible new members. Is the SCA a LARP? Looking at the SCA using the simple description of LARP mentioned earlier, one might see the confusion newcomers have when looking at the SCA; participants assuming the roles of fictional characters, acting out the lives of these character in a live setting, and doing so with a mutually agreed upon set of rules. On the surface the average SCA event does not look all that different from the average LARP event. However the SCA is only considered a LARP if you stop at the point of simple surface comparison and fail to include the many aspects that make the SCA unique from other activities. Is the SCA a LARP? No, it is the SCA. Part of the problem is that the term “LARP” is an outdated concept that no longer adequately describes the activities (including most LARP games) that get lumped under the LARP “umbrella”. It’s no different than trying to describe every athletic activity as simply “sport”. The interesting fact is that even groups closer to the general description of LARP dislike being called a LARP and all for the same reasons that many in the SCA dislike the label. The world of LARP started to spread out. LARP games in the early eighties tended to remain isolated from each other. In part this was because of player loyalty to local games, but also because it was harder to find and participate in other groups due to distance and lack of easy communication. While not as common, some groups would encourage isolation to prevent losing players to rival games and did not take kindly to any attempts to recruit their members. Recruiting in this environment was difficult because players that became interested in a new group would often leave one game completely to go play another. This isolationism started to decline as the number of games started to grow making it easier to travel to more games and the internet made contacting these groups easier. Slowly the LARP player base started to spread out. At the same time it became more common for people to participate in multiple games at once based on their interests or location; a practice called “cross-gaming”. The important aspect of cross-gaming and recruitment is that groups no longer have to force players to choose between groups, but instead could encourage them to participate in multiple games at the same time. What makes recruiting in LARP groups a viable possibility for the SCA? Whatever the genre of the local LARP group (horror, fantasy, etc.) the average LARP player shares enough in common with the average SCA member that they might find the SCA interesting. Most LARP participants travel to events, go camping, struggle with packing too much into small cars, rushing to finish last minute projects, and have war stories to share just like SCA members. If you ignore the little details of how and where, most of the experiences are the same. The SCA might offer activities that the person’s local LARP group does not offer such as martial activities, archery, thrown weapons, and arts and sciences. The SCA also has activities that interest a wide range of ages, lifestyles, and different levels of physical abilities. This allows the SCA to recruit people who have a hard time fitting into LARP groups; families with children for example. Another nice feature of the SCA is that it is international. Over the years LARP has grown into an international pastime, but many groups remain local or at best regional. The international aspect of the SCA might interest migrating people such as college students, members of the military, or people who travel for work. Since the SCA is virtually everywhere and for the most part shares the same traditions and rules, a traveler can easily and quickly fit in wherever they end up in their travels. Lastly many LARP players already know about or participate in the SCA on some level and might be interested in getting more involved or returning after an absence. What are the best ways and the worst ways to recruit LARP players? Like any recruitment there are pitfalls to avoid and good and bad ways to proceed. The most important thing to keep in mind when recruiting around LARP groups (or any group really) is to remain open and honest. Never make it seem like the SCA is trying to convert or recruit by subterfuge. Showing up and pretending to be new to the concept of LARP or the SCA (or just acting willfully oblivious) is a guaranteed way to alienate people. The truth will come out down the road and that will ruin any chance of a good relationship with the group. Instead open with something like, “I’m with another group called the Society for Creative Anachronism and I am curious about your group”. Ask questions about the LARP and if people seem interested, explain the differences between LARP and the SCA. Avoid talking down about LARP when comparing it to the SCA. As mentioned before try to focus on the things that the two activities have in common instead of talking about the pros and cons of each. Each person’s view of what constitutes a pro and con is different. Understand that when members of two groups come together there is a natural tendency to try and compete. Falling into this competitive trap might win some sort of perceived short term moral victory, but really helps no one in the long term. Don’t go in trying to recruit the whole group. Some people might be interested in the SCA, but this does not mean the whole group has to come and try it. Support the individuals who are interested and avoid putting them in a position where they have to choose between activities. In most cases, forcing a person to make a choice will result in the person choosing the group they are currently with. People go with the things they know. The important thing to remember is that recruitment is not an all or nothing deal. The modern LARP player base enjoys playing a large variety of games and many will loyally participate in multiple groups at the same time (remember the trend of cross-gaming). Avoid the mindset that people who LARP do so because they have not experienced the “magic” of the SCA, or worse yet, picked LARP because they can’t handle or “cut it” in the SCA. It is important to keep in mind that many LARP players are fully aware of the SCA and simply prefer LARP. A specific example of this is fighting. Most LARP groups use padded weapons for combat (boffer weapons), but in the SCA padded weapons are typically reserved for children. It is easy to assume that LARP fighters use padded weapons because they can’t handle heavier fighting styles, but in reality most groups use padded weapons because that is what they know. Granted using padded weapons allows a larger number of people participate because it is cheaper and requires less protective gear, but this does not mean LARP fighters don’t take their fighting seriously. Many spend just as many hours practicing as your average SCA fighter; it just happens they use a different type of weapon. There are also some LARP people who avoid the SCA because they received incorrect or biased information about what the SCA is about or had (or heard about) a bad experience in the past. How many times has someone responded to talk about the SCA with “I heard they complain about people that are not historically accurate” or “getting involved is just too expensive”? This misinformation is often the reason the person started playing LARP instead of exploring the SCA. If the person is interested, this is a great opportunity to give people the correct information about what the SCA has to offer. Try not to push or oversell the SCA if the person is not interested. Simply meeting and getting to know people is often the best form of recruitment. A small seed of mutual interaction now can lead to new SCA members down the road. If nothing else the person may come away with a new and hopefully positive experience to replace the earlier negative one. Lastly, don’t go into a group assuming they like being called a LARP any more than the SCA does. There are new subgroups of LARP like activities that do not consider themselves LARP. Many of these are groups that focus on combat and battle activities and limit the fantasy elements seen in most LARP groups. These games are sometimes called live action battle games. This might seem like a fine line but being aware of this will help avoid pitfalls that could hurt another otherwise beneficial meeting. Recruitment can work both ways and that is not a bad thing. A reoccurring theme in this article is the development of a good relationship with local LARP groups, often to the point it might seem a lopsided effort, but the advantage is not as one sided as it might seem. Developing a working relationship with local LARP groups can help with recruiting for all groups involved. Remember recruiting is not an all or nothing deal. If the SCA maintains a good relationship with local LARP groups, it creates a self-maintained recruiting ground for all groups involved. New people that come in contact with the LARP group but have interests more geared to the SCA can be put in contact with the SCA. People who come in contact with the SCA but are a better fit for LARP can be sent in that direction. In the end it is better for everyone involved to keep interested people involved in the hobby on some level instead of losing them altogether. Plus, as their interests or levels of participation change (age, families), the person already have a good point of contact to seek the group that fits them best at the time. This also increases the public exposure of both groups because working as a team they can attend more events and demonstrations than one group working alone and in turn can cover more ground and meet more potential new people. There is also the advantage of the two groups attending the same event and supporting each other’s recruitment efforts. With growing concerns about getting new blood into the SCA, looking for potential sources of new members is more important than ever and LARP groups are part of that potential. Hopefully this article sheds some light on that value and gives some insight on how to recruit in that environment. I am always interested in feedback, suggestions, and tales of personal experience with the subject and welcome people to contact me. Many of the Larps are becoming “serious” these days. Plastic armor is allowed but doesn’t count for much ( nearly ZERO) and cardboard or duct tape or aluminum also worthless , “authentic, period” materials (leather, steel) are preferred. Some of the Larps are geared entirely to fighting, no “magic” or monsters. Seems to me that the line between LARP and SCA is becoming less defined as time goes by. Some of the Larps have “events” just like SCA- Feast, A&S ( yes, some of the Larps have Arts and Sciences now). There are some HUGE wars that make Pennsic seem a small weekend event.The Larps still retain an ease of participation- just pick up a foam sword or maybe go as a wizard with spell-throwies. The Rhydderich Hael has benefited greatly from members who also do LARP. As a person who has cross gamed in the larp community I am surprised at the stigma the SCA has placed on recruiting from larps. While we fight with foam swords many of the techniques used by the top tier fighters in larps transfer over very well into the sca style of fighting. I know in Amtgard the larp I am most involved in, the speed and accuracy needed to be a high level fighter transfers over well to games like Dagohir, where the finesse of Amtgard fighting gives a definite edge over the more brutish fighting style of pure Dag players. I also know several Amtgarders that went to SCA and were highly successful in the martial skills and a&s skills.